People tend to fall into two camps: those that like crisp chocolate chip cookies, and those that prefer them chewy. For me, I want a cookie with a slightly crisp edge that is chewy in the center. I don't want a cookie that's too doughy, hard, or crunchy. We can agree to disagree if your preferences don't align. Those things matter a lot, but it's important to note that your results will differ based on the fact that every egg is different, the way each person scoops their flour differs, the lightness or darkness of your baking sheet affects the cookie, the quality and type of your sugar matters, the type of chocolate chip you use makes a difference, and so on and so forth. Just like pizza, your cookie will taste good even if it doesn't always match up to your dreams. But if you're unsatisfied with the results, keep fiddling with those things until you arrive at your cookie nirvana. The one thing that everyone says makes the biggest difference is baking the cookies on a baking stone. I don't own a baking stone (yet), but my stubborn side also feels like there has to be a way to create cookie perfection on a baking sheet. I've done it before with other recipes, so why should this type of cookie be any different? There are a lot of similar recipes on the Internet, and I have tried so many that my own recipe is derived from all of them. Most recently, I have been using this recipe as my starting point, sent along to me by my friend. After I made these cookies, I found this post which has a similar recipe, and if you want to get super technical it has all the info you need. I'd like to thank all the chocolate chip cookie makers who have come before me and already discovered these ratios... I'm happy I'm catching up. Preheat the oven to 350°F/176°C. In a medium bowl, sift together your flour, baking soda and salt. Set aside. In a stand mixer using the paddle attachment, beat together the room temp butter, shortening, white and brown sugar. Beat until the mixture is light and fluffy, no less than 3 minutes, and you can go as long as 5 minutes. You can't over beat your dough at this point. On medium low, add the eggs one at a time until fully incorporated. Add the vanilla extract. Beat for a minute. On low, slowly add your flour mixture to the egg mixture a little at a time. Mix until just incorporated. You can over-beat your dough at this point, so don't let the flour mix too long. If you're nervous, stop the stand mixer, take the bowl out, and finish mixing up the wet and dry ingredients with a wooden spoon. Fold in your chocolate chips until they are evenly incorporated. Again, be careful not to over mix. Place your dough in the fridge for 20-30 minutes (truthfully, it didn't make THAT much of a difference whether or not I chilled the dough first, but lots of people swear this step is crucial... so there you go). At this stage, an inexpensive piece of equipment makes a huge difference in the outcome of the cookie. I use a 1.5 tablespoon ice cream scoop to make even balls of cookie dough. I use that same ice cream scoop for meatballs, matzoh balls, and for ice cream (of course). It's a good investment and really helps these cookies become the right shape and size. 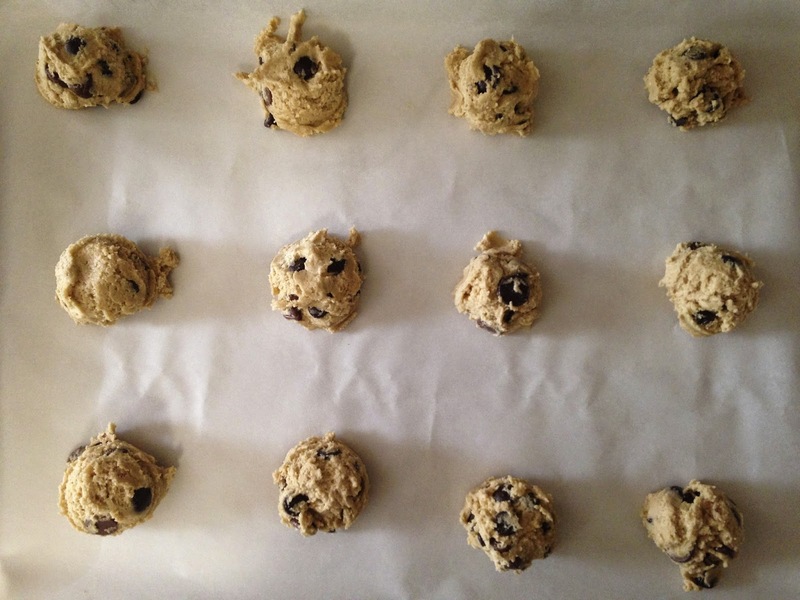 Scoop out 12, 1.5 tablespoon-sized balls of dough onto a parchment-lined baking sheet. Space each piece of dough a few inches apart. Resist the urge to flatten the dough. The cookies come out less chewy when I've done this. Bake the cookies in the oven for 8-9 minutes or until the edges are just slightly starting to turn golden. Your cookies will look a little underdone. Don't worry about that. If you want a chewy cookie, err on the side of under-doness. Also, the cookies will continue to cook as they cool. Keep the cookies on the baking sheet for 2 minutes (no more). Transfer them to a cooling rack so that they can cool properly. This final step is as important as any of the ones that came before it. If you leave the cookies in the pan, they will continue to cook and will potentially become too dry and won't stay chewy. That would be a bummer. A cooling rack is another great inexpensive investment, and a must for anyone that likes to bake things. Let the cookies cool for 8-10 minutes, or for as long as you can resist biting into one. Serve with milk. Cookies will stay chewy and great for 3-5 days after baking, but they probably won't last that long. You can also scoop and freeze the dough. If you are baking frozen cookies, make sure the dough comes to room temp (about 30 minutes) before you bake them in the oven.